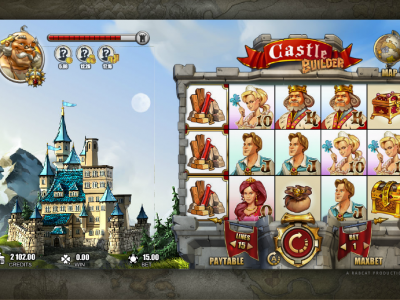 Castle Builder is a unique online pokies that will takes you on a journey to a mediaeval world of fantasy. The Vegas style pokies is a 15 payline, 5 reel slot which provides an innovative different approach versus regular gameplay where you take the role of a castle builder. The game revolves around building castles for the kings of the realm. If you build a castle the king is proud of he will reward you with a payout. You will find many medieval symbols including Kings, princesses, princes, treasure chests, bags of coins, building materials and vault doors. When you have a spin resources are gathered for the construction of castles. Once the castle is built, the princess moves in selects from 3 admirers. These admirers each boast individual levels of riches, from peasants (small win), to the average citizen (medium win) and the rich (high win). You will be able to discover 3 different exciting kingdoms providing different characters and the ability to build some 35 different castles. Unlike any vegas pokies you have played before the game features beautiful graphics and amazing sounds along with multiple bonus features. Start the adventure today and enjoy this fantastic Australian pokie.